Buying a bike isn’t just about the bike, which is something many cyclists find out far too late. Although the bike, as in what model, make, size and shape, is the most important thing there are so many different accessories that go into becoming a cyclist. 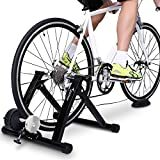 If you want to ride your bike professionally in racing, cycle as a workout or even just as an alternative way to commute, there are some bike accessories that you need. Bike accessories are typically designed to make cycling safe, controlled and enjoyable. Depending on the kind of cycling that you are getting up to, the type of bike accessories and how many you need may differ. It is important to be prepared and protected. Don’t forget bike chain lube for easier pedaling! We have researched various websites and brands to find the ten best bike accessories you need in 2019. This phone mount is a specially designed cycling bag that can keep your phone safe, visible and within reach when on the road. It has a high sensitivity TPU touch screen that supports all touch operations when your phone is in the bag. This means that you can answer calls, check your locations on GPS and is incredibly convenient for cyclists. 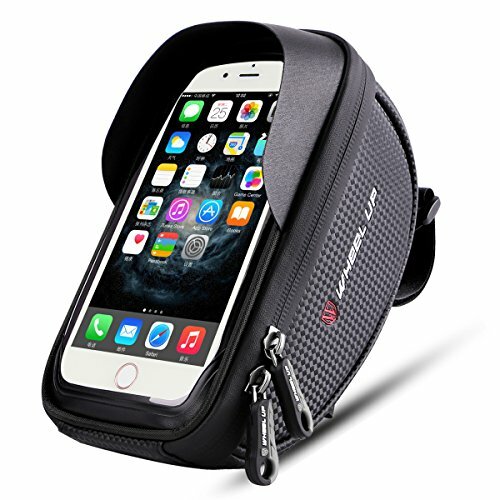 This phone mount bag can support all cellphones under 6-inches, which includes iPhone plus models. It is waterproof and has a well-sealed zipper that can keep your phone secure, dry and cool in all weather conditions. The strong velcro strap is incredibly easy to install and can be used on all bike models. Why We Liked It – This phone mount is a convenient and essential tool for all modern cyclists as it keeps your phone within reach, even when on the road. 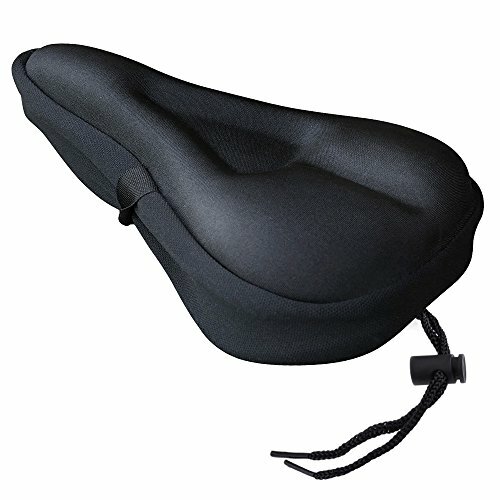 This bike seat cover is designed for comfort and is made from high-quality materials to protect your bottom when riding. It is shock absorbing which means you can ride for longer without causing damage or feeling uncomfortable. This bike cover has a universal fit that should work on most bike seats. It is incredibly easy to install and is a low-cost solution to saddle sores. As well as this gel seat cover, which is incredibly comfortable, this bike seat cover comes with an additional waterproof cover to protect your seat from all weather conditions. It is a great value kit and can make a difference to all cyclists. Why We Liked It – Riding for a long time on your bike never has to be uncomfortable again with this easy to use seat cover. The most popular kind of bike accessory is a bike bell like the accmor Classic Bicycle Bell. Bells are vital for almost every kind of cyclist as they work to allow motorists and pedestrians to know that you are coming. 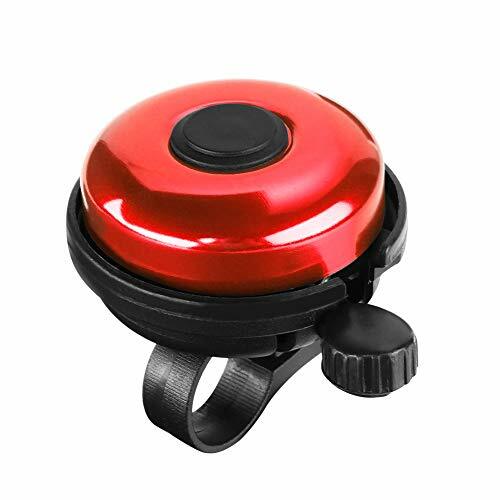 This bike bell is suitable for children and adults, as it comes in a range of colors to suit your bike. It has an aluminum body that lets out a crisp ringtone that everyone around you can hear. This particular bike bell has been made for mountain and road bikes as a safety precaution. This bike accessory is easy to install and has a special design for left-hand use. Why We Liked It – This high-quality aluminum bike bell can keep you safe when riding on the road as it has a loud ringtone. 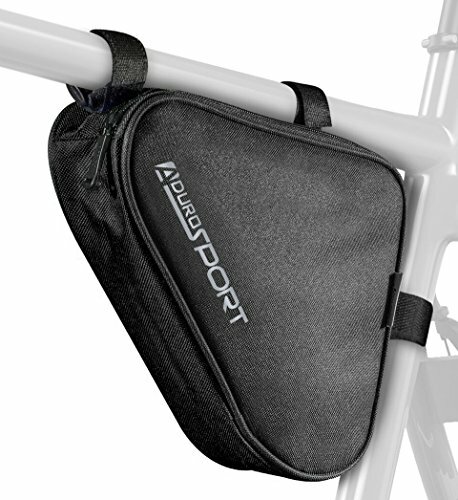 This cycling saddle bag is easy to connect under your bike tube and has adjustable Velcro straps to make it suitable for most bike models. It has easy access big zippered mouth so you can have excess to your phone, keys and other essentials when on the road. Having a storage bag with you is one of the most sought after bike accessories as it ensures that you can go further afield. This bag is made from durable and weather resistant materials that will keep your items dry and secure. It is a good size that can fit almost all of your essentials when cycling, including a small pump or other bike accessories. Why We Liked It – This saddle bike storage bag is a convenient and easy to use storage solution when on the road. Most bike accessories are designed to keep you safe when on the road and bike lights are one of the best. 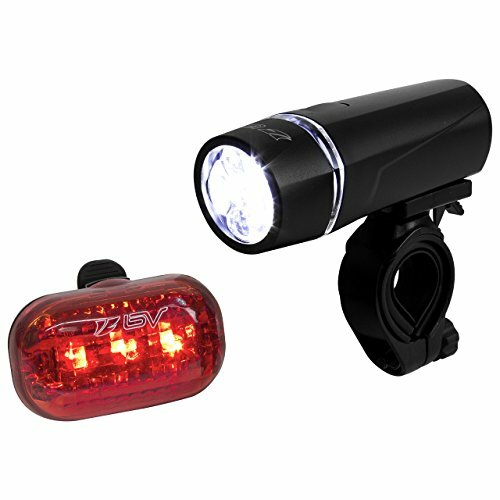 This BV Bicycle Light Set includes a super bright headlight and a red taillight, which conform to the legal requirements. When cycling at night, you need to have lights on your bike, both a bright white headlight at the front and a red taillight on the rear. This bike light accessory set is easy to install and can provide illumination for up to 80-hours. It is weather resistant and can fit most handlebars. The bright headlight can also be used off-bike as an emergency flashlight as it has a quick release mount. Why We Liked It – This bike light set is easy to install, suitable for most bike models and conforms to legal requirements. Cycling can be incredibly fun, and this bike accessory is designed to make it even more so. These LED bike wheel lights have been seen all over television due to how fun, attractive and easy to use they are. There is a great range of colors available, including a rainbow pattern. Children and adults alike will enjoy cycling with these bright lights attached. Not only are these bike lights super fun to use, but they can also make cycling at night or in dark locations safe. No one will be able to miss your bike when you have these wheel lights attached! There are two light modes that can be used for a constant beam or an eye-catching flashing setting. Why We Liked It – These wheel lights are a super fun bike accessory that can be used to keep you visible at night. This bike tool kit is a 16 in one set that can be used to fix almost every issue you may face with your bike and bike accessories. This one simple kit has 16 different tools contained within, including a range of Allen keys; a socket hex wrench; slotted screwdriver and a socket extension rod to name but a few. With so many tools in one, this is a must-have-bike accessory. It is a compact toolkit that can come on the road with you to fix any mishaps that may occur. This set is ideal for beginner or young cyclists as it makes every issue easy to fix and handle. Why We Liked It – This compact tool kit is the must-have bike accessory of the year as it makes every issue easy to fix. In these modern times, being able to remain connected is so important which is why one of the best bike accessories is a phone mount. 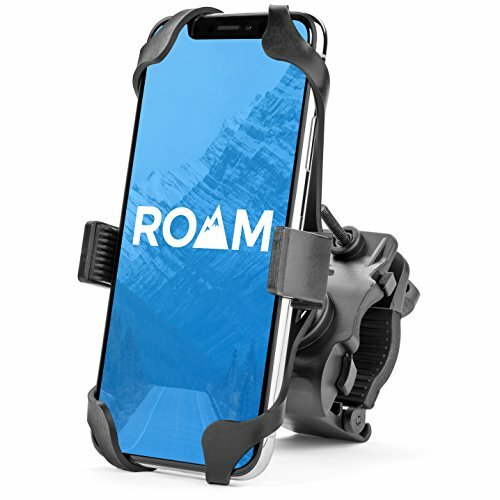 The Roam Universal Premium Bike Phone Mount is suitable for most phone models and can be easily attached to bike frames. The size is adjustable so it can be secured to your handlebars. This phone mount has two points of contact, a hard plastic clamp and silicone net, to keep your phone secure when attached to your bike. Being able to see and handle your phone when riding ensures that you always have access to GPS and hands-free calls. Why We Liked It – This phone mount is secure and keeps your phone visible when on the road. This water bottle cage ensures that you can stay hydrated when on the road and can hold 26-ounce bottles. It does need to be screwed onto your bike, which ensures that it is secure and will not fall off when riding. It is made from aluminum alloy, which is a high quality and durable material. 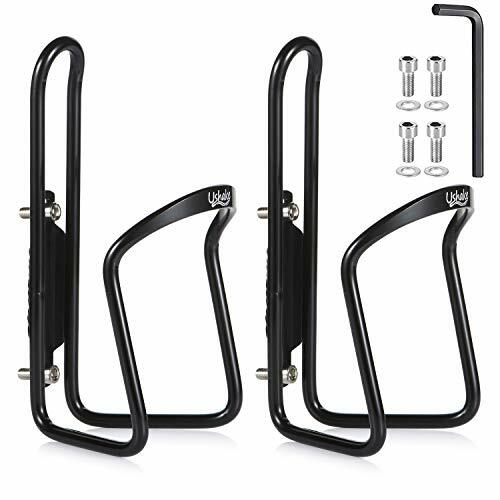 Even though it needs to be secured onto the bike, this bike accessory is incredibly easy to install and only requires a hex key which is included. This bottle holder bike accessory is well designed to hold most bottles and cups. The cage arms can be easily adjusted. Why We Liked It – This water bottle cage is a great bike accessory for those who go on long bike rides and want to stay hydrated. 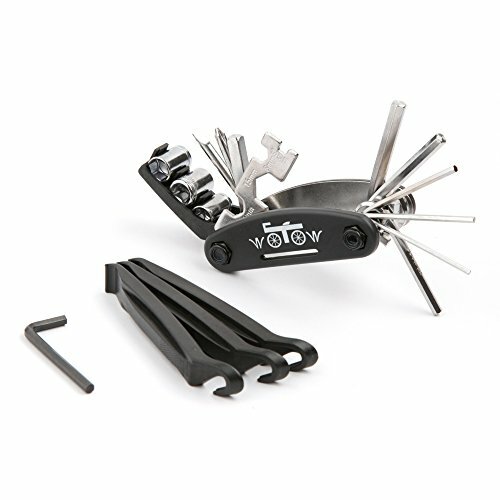 This compact toolkit is ideal for on-the-go emergencies and is made from high-tensile steel, which is the same material that most bikes are made from. This toolkit is equipped with screwdrivers, spoke wrenches, chain tool, hex wrench, and Torx. It also comes with a lifetime warranty which ensures that all bike emergencies can be fixed. This compact toolkit is not only durable and effective, but it is also made to be convenient as it comes with a stylish tool flask. This flask makes it easy to transport, and you can keep this toolkit on you for all emergencies. With this flask, you can prevent damage to both the toolkit and your backpack or storage bag. Why We Liked It – Accidents happen, but with this high-quality and compact toolkit they never have to be an issue again. As a beginner into cycling, it is likely that you will feel overwhelmed by the choice and range of bike accessories that are available from the bike shop. Most people will realize too late that buying a bike isn’t where your cycling purchases end. Alongside your high-quality bike and road bike helmet, there is a range of bike accessories that you may need. Most bike accessories throughout this review are designed to make cycling safe, but a lot can also contribute to how fun and comfortable the sport is. Beginners to cycling may benefit from a range of bike accessories in order to make the process of getting on a bike and riding regularly more comfortable and enjoyable. Throughout this review, there is a range of bike accessories that have been specially designed to make cycling safer. If you are riding your bike to work, on the roadside or in other public locations, then there are some bike accessories that you need. One of the most popular bike accessories is bike lights. It is actually a legal requirement for cyclists to have a white headlight on the front of their bikes and a red taillight on the rear when riding at night. If you are going to be cycling on roadsides during the dark weather, then you need to purchase a set like the BV Bicycle Light Set Super Bright 5 LED Headlight. This set includes both of the necessary lights that you need when cycling at night. It is important for you to have a flat beam headlight and a taillight to keep you visible and warn motorists that you are there. This is a great way to actively prevent accidents and generally keep our roads safe for everyone. Staying visible doesn’t always have to be serious or boring. 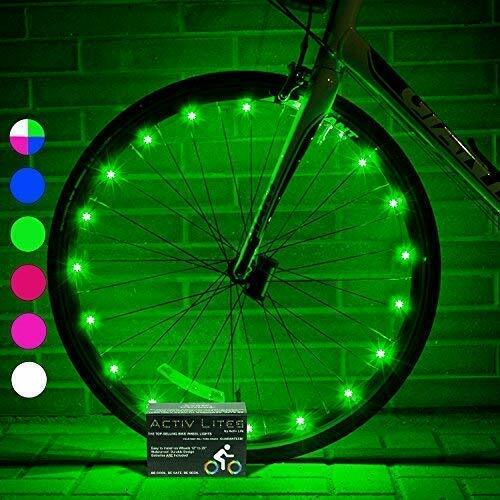 Bike accessories like the Activ Life LED Bike Wheel Lights still keep you visible but are more fun. These rainbow wheel lights can be used for adults and children and is a great way to get people excited about cycling. Bike bells, like the actor Classic Bicycle Bike Bell, are perhaps the first bike accessory that most cyclists will purchase. Having a loud, easy to use and quickly assessed bell is a great way to warn pedestrians that you are riding close by. Having a bell is not as essential if you are riding your bike in remote locations for exercise, although it could still benefit you. However, if you are cycling in public places, such as when on the work commute, then you should have a high-quality and loud bike bell. In these modern times, it is very difficult for most of us to be separated from our cellphones. There is a range of bike accessories that are designed to keep your phone within reach when riding your bike. Phone mounts, such as the Wallfire Bike Phone Mount Bag and the Roam Universal Premium Bike Phone Mount, are designed to keep your phone within reach when riding. Bike phone mounts can be installed onto your handlebars and allow you to have access to GPS or hands-free calls when riding your bike. Alternatively, your cellphone can be placed into a bike storage bag such as the Aduro Sport Bicycle Bike Storage Bag Triangle Saddle. This bag can be attached to the frame of your bike and has a great wide mouth that can keep all of your essentials close by. Of course, if your phone is kept in a storage bag, then it will be harder for you to use it when you’re actually riding. It is up to you to determine how much you will actually need your phone when on the road, but it is always important to stay connected – especially if riding alone. When you have a bike, there is a range of things that can go wrong either during or after a ride. Luckily there is a range of bike accessories that are specially designed to keep you prepared. 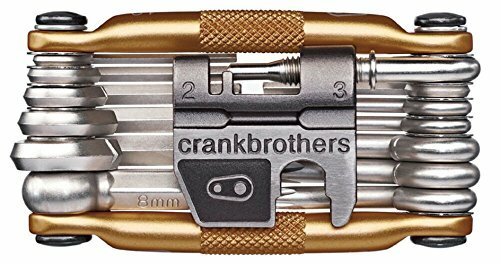 Toolkits like the Crankbrothers M19 Bicycle Multi-Tool feature a range of essential tools in one compact body. This means that you can be prepared for any issue that your bike may come across. As the toolkit bike accessories throughout this review are compact, they can be used on the go. This means that no matter where you are riding and what may happen to your bike, you can be prepared. Having your own toolkit ensures that you can avoid charges from bike repair stores if something goes wrong. You can tighten bolts, fix knots in the chain and adjust your bike to suit your height whenever necessary without having to get anyone else involved or paying more money. As a beginner cyclist, it is likely that you will have a lot of questions about what you need, how these bike accessories work and the sport in general. Finding out exactly what you need and what can make cycling easier can be difficult to determine. How often should I repair my bike? Although accidents of the road can happen quite often, you may be one of the lucky cyclists that doesn’t experience any issue for months on end. With the variety of bike accessory toolkits that are available, you can repair and fix up your bike at home. This means that you can avoid the expensive prices from bike repair shops. If you are repairing and maintaining your bike at home, then it is recommended that you undergo a full body check every couple of months. This will differ depending on how often you ride your bike and where you ride it. What bike accessories do I legally need? It is a legal requirement for cyclists to have lights on their bikes when riding at night. It is standard for cyclists to have a headlight on the front of their bike and a red taillight on the rear to keep them visible at all times. You also need reflectors and working brakes. Did You Know? : It is a legal requirement for cyclists to have a headlight, taillight, and reflector on their bikes. Expert Tip: Keep a compact toolkit on hand at all times so you can repair any issue and avoid charges from repair shops.